Boxed Leader Kit for a seven-week curriculum exploring how to engage with the world with compassion and justice. 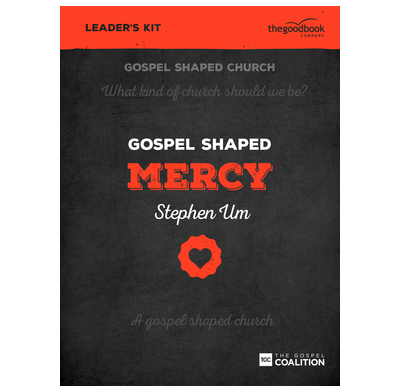 Gospel Shaped Church is a new curriculum from The Gospel Coalition that will help whole congregations pause and think carefully and prayerfully about the kind of church they are called to be. This seven-week track explores what it means to be a community engaging with the world with compassion and justice. The Leader's Kit contains everything you need to evaluate the course: a Leader's Guide, Handbook, DVD, Quick Start Guide and SD download code. "Churches called into existence by the gospel should also be shaped by the gospel in their everyday life." "The Gospel Coalition believes in the priority of the local church, and that the local church is the best place to discuss these five ministry drivers and decide how to integrate them into life and mission. So, while being clear on the biblical principles, these resources give space to consider what a genuine expression of a gospel-shaped church looks like for you in the place God has put you, and with the people he has gathered into fellowship with you." We live in a world that regularly groans under the weight of division and injustice. Here is a unique opportunity to be deeply equipped to answer these groans through a gospel shaped doing of justice and mercy. Lead Pastor, Roosevelt Community Church, Phoenix, Arizona, and TGC Council member. Gospel Shaped Mercy meets that often neglected, sometimes even maligned, aspect of ministry within contemporary evangelicalism. The material is of the highest quality, both in terms of content as well as presentation. Probably the most helpful aspect though, is how integrated the course is; including DVD teaching, material for personal devotions, group Bible study, individual journaling as well as outlines for an accompanying sermon series. If you are looking for a course to help you and your church discern what the LORD might be calling you to do then look no further, here it is!